If the ice in the ice skating scene pictured on the back cover looks especially blue, it's because colored water was used in order to make the ice look better in Technicolor. According to modern sources, the 1952 film cost $2,606,644 to make, but grossed only $1,993,000. I'm pleased to add a few more dollars to the take by purchasing this release. Are there more MGM musical offering possibilities? The Cult of Jerry may be something else but the Cult of Judy is off the charts when it comes to seeking every nook and nugget!! There never was a CD release for "Broadway Melody of 1938", "Ziegfield Girl", etc., etc. The sound clip for track 18 ("I Wanna Be a Dancin' Man") sounds like it has some stereo spread, at least when compared to the other tracks. Don't know about all of the material, but from the clips it sounds like for at least Astaire's "I Wanna Be a Dancin' Man," Lukas has picked up the stereo mix that was available via the THAT'S ENTERTAINMENT 3 theatrical release. This 1952 period is rocky for MGM stereo since so many of the stereo stems were mixed to mono and then thrown out. But Lukas is pretty thorough, so I imagine he has utilized as much for his album mixes as is still available, whether it be mono or stereo. It feels like this CD release might contain a bit more material than was available for download, but I haven't checked it against the download version so I don't know for sure. Has anyone else done this? If Lukas continues with these musicals, I hope he doesn't use the download material and, instead, goes back to what is totally available in the vaults for each title. I DO know that the download version of DEEP IN MY HEART didn't have everything that was available, particularly in the area of underscore. Great news, it was about time! When was the last MGM Musical on Rhino Handmade released? In 2004? Hope this works for Lukas in terms of sales! don't mean to sound spoiled, but any chance for Warren & Gershwin's "Barkleys Of Broadway"? This is FANTASTIC news. Let's hope for more. I have the download and don't think there is any extra material here BUT to have this as a proper CD with liner notes & full track details is AMAZING !!! The color artwork on the packaging of this CD is beautiful.....and though we all love Harry Warren, Johnny Mercer, Adolph Deutsch, Roger Edens, Conrad Salinger and Alexander Courage.....does anyone else find it curious that the primary artist of this disc, and the only reason the film exists at all, is Fred Astaire---and his name is to be found NOWHERE on the exterior packaging!!! I wonder if this is a matter of simple oversight or, possibly, avoidance of the musical roots of this release, or, possibly, the litigious nature of Mrs. Robyn Astaire. I'll be buying a copy at some point soon. As noted elsewhere, I need to see what VS has coming out before I make my orders from places. I can't believe it! This is really great news! I've thoroughly been enjoying the "Belle" songs on the "Fred Astaire At M-G-M" set for almost a decade now. 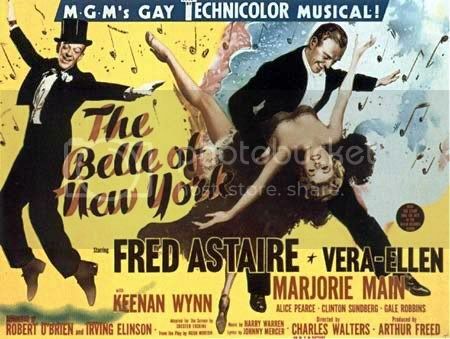 Although the songs in "Belle Of New York" were not as enduring as that in other Astaire musicals (just think of the standards from the RKO pictures with Ginger Rogers and "The Band Wagon" or "Easter Parade"), they are still catchy and nice nostalgic treasures. There's also been a single by Doris Day featuring "Baby Doll" and "Oops" which is quite recommendable. I've had the download for several years, but rarely returned to it due to the frustration of not having it in lossless sound quality (all efforts to download the lossless version failed - now I'm glad about it ). I was hoping that this would be part of the recent Rhino re-issues by Sony Classical - and now we're getting it from FSM. I hope this release contains recording details in the tradition of the old Rhino releases. Well done, Lukas! Hopefully, this will prove to be successful and even the path for further releases from the M-G-M library (there must be plenty of unreleased material from the 1930s to the late 1950s).